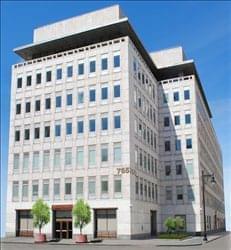 Find My Workspace lists over 95% of the executive office suites market in Newark. Simply click Request Quote to check pricing for one office, or Add to Basket for multiple offices. In the heart of Newark’s central business district, this office building offers 15 stories of high quality, highly accessible office space at affordable prices. Dramatically modernized with the latest technology and modern business conveniences make this the right choice for today’s business leaders. Discover how major improvements make this the perfect home for your organization. Recent renovations include state-of-the-art high speed elevators, new lobby, new exterior, new HVAC system, and high speed fiber optic communications. Property features include responsive on-site property management, 24-hour access 7 days a week, and 24-hour manned security. Typical floor plates are 15,000 square feet and building management offers tenant build-outs to suit your needs with signage opportunities. Distinguished by its white marble façade, this graceful, 200,000-square-foot office building features sweeping, 30,000-square-foot , build-to-suit floor plates and a prestigious Newark Central Business District address. Built by Prudential in 1957, as a sister building to its world headquarters this seven story, multi-tenant property recently has been renovated with a beautifully appointed lobby, new elevators, updated common area and upgraded building systems. It offers 24/7 access and manned security. Simply put, this building is a great value play for companies with larger requirements and a desire to be in the heart of the state’s most exciting city. 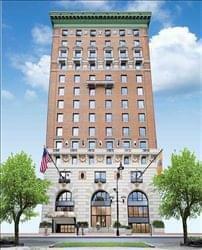 Located in ultra-modern high rise office tower within the heart of Newark’s bustling central business district. A comprehensive refurbishment of this 85-year-old, 21-story landmark office tower in 2001 included mechanical upgrades, new windows and exterior restoration to bring the property to modern standards. In 2010 another major improvement project was completed, which updated the lobby, core building and elevators, and introduced a fitness center and conference room for the tenants. As part of that effort also established was street-level retail that can be accessed from both outside and within the building. 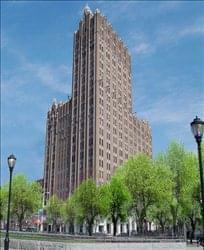 The property offers on-site parking a commodity in downtown Newark. 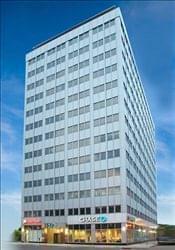 This fantastic office building complex contains a prestigious roster of tenants who enjoy first class amenities. These include Maize, a casual style restaurant, high tech meeting and conference rooms, state-of-the-art fitness center, a picturesque exterior roof garden and beautifully appointed guest accommodations. All tenants will receive responsive, on-site property management with 24/7 access with 24-hour security. Recent renovations include three new computerized elevators, new lobby, exterior, and bathrooms. Its 8,000 square foot floor plates make it easy to build out space for your companies needs.